Miller was born in Baltimore. He studied portraiture with Thomas Sully from 1831-32. In 1833 he went to Paris to study at the Ecole des Beaux-Arts and later at the English Life School in Rome. Upon his return he opened a portrait studio in Baltimore but was unsuccessful. In 1837 he moved to New Orleans where he was selected by Capt. William Drummond Stewart as artist to record a journey to the Rocky Mountains. The expedition journeyed by wagon along what was to become the Oregon Trail. Miller sketched the Native Americans along the way and also recorded the rendezvous of the mountain men in what is now southwestern Wyoming. 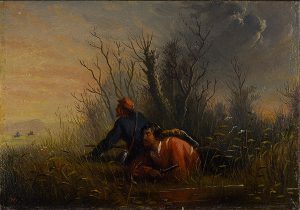 Miller returned to Saint Louis with about 166 sketches which were later developed into oil paintings while in New Orleans and Baltimore. From 1840 to 1842 he lived in Stewart’s Murthly Castle in Scotland, Painting oils as decorations depicting favorite episodes from the trip. He also delivered a portfolio of 83 small drawings and watercolors. Miller spent the rest of his life in Baltimore painting portraits and making copies of his Western themes.